In order to obtain the surface stiffness and internal flexibility of various mechanical components used in automobiles, aircraft, ships, building materials, machine tools, and other items, a heat treatment called carburization is applied in which the amount of carbon in the surface coat is increased, and only the surface coat is quench hardened. The choice of solid carburizing, liquid carburizing, gas carburizing, vacuum carburizing, and other techniques is made according to factors including production volume, size of equipment and facilities, and necessity of automation. However, there is a trend toward gas carburization because adjustment of the degree of carburization is relatively easy, lending itself to automation and mass production. The CX1000/CX2000 Control and Measurement Station automatically computes the equilibrium carbon concentration (carbon potential, or CP value) of the atmospheric gas carburizing furnace, and maintains the optimal CP value inside the furnace. It is not possible to directly measure and control the carbon potential (CP) inside an atmospheric gas carburization furnace. Therefore, adjustment of the furnace atmosphere used to be performed by simply using a dew cell dew point indicator. To gain the advantages of sensitivity and rapid response, the mainstream has more recently adopted infrared gas analyzers for controlling CO2 levels, and zirconia type O2 sensors for analyzing O2. The CX1000/CX2000 supports both infrared gas analyzers and zirconia type oxygen sensors, and automatically and internally computes the CP value according to the output from those devices. By incorporating this automatically calculated CP value into a PID control loop as a process value, real time monitoring, control, and recording of CP values can be performed very easily. Also, pattern control of the internal temperature of the furnace is necessary in order to correct the temperature rise time according to the acceleration of carburization and wall thickness of the item being processed, as well as perform primary and secondary quenching and annealing after carburization. However, in addition to being able to control multiple loops, a single CX series instrument can control the CP value while performing pattern control of this internal furnace temperature. The CX1000 has a compact case (144 mm x 144 mm), can control temperature and CP simultaneously, and functions like a paperless data recorder. You can instantly determine the progress status even when running programs by viewing the PV/SP simultaneous display and time base display. 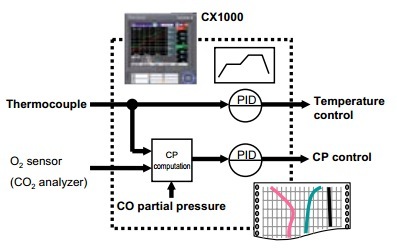 The CX2000 enables independent PID control on up to six loops. The capability of CP computation on all six loops makes it equally applicable for large-scale continuous carbonizing furnaces. Compact and highly cost-efficient, the CX offers an excellent solution for multi-loop PID control. Both the CX1000 and CX2000 support zirconia type O2 sensors and infrared CO2 atmospheric gas analyzers. As they can be mixed in a single system, you can display phenomena measured on both the O2 sensor and CO2 analyzer for comparison. Control is performed with the O2 sensor since it offers faster response time, and confirmation is performed by the CO2 analyzer, which is more accurate. With its CP value calculation function, the CX1000/CX2000 can be applied to a wide variety of applications involving atmospheric gas carburization, and offers a simple, high costperformance solution for improving quality and efficiency. Also, digitally recording the control process will yield low cost operation well into the future.